It’s almost unbelievable how a single, simple intuitive act can have little impact upon one’s life until 30 years later, when it makes a significant difference. This sounds like a theme for a romantic comedy that takes itself too seriously, but actually I’m thinking of the Carrot Cookbook. This recipe collection was published as a fundraiser by Santa Cruz’s Planned Parenthood in 1978. At the time, I couldn’t have cared less about carrots. I purchased this slim volume as a follow-up to PP’s Zucchini Cookbook, which had helped me use up our rapidly proliferating squash crop. I was compelled beyond reason to own the companion volume. Luckily so, because 34 years later, as a seasonal cook, this second book is most useful. Since so few veggies are available in winter, Carrot Cookbook recipes appear with regularity on our table every January. This old school Santa Cruz curry is a good example. 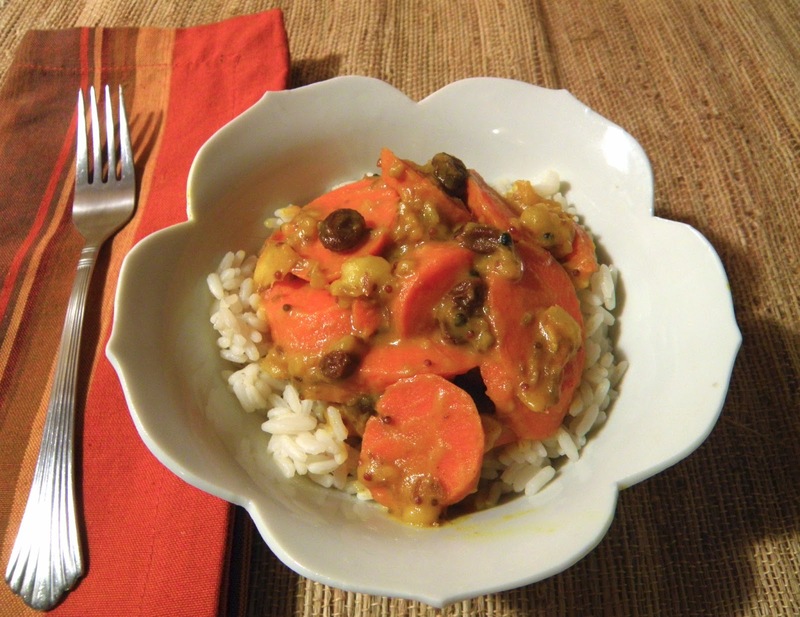 Carrot curry contains both orange juice and bananas, but neither dominates the dish. Mostly it’s about the spices and the sweetness, though no sweeteners per se are added. Carrots themselves are sweet, and the raisins, banana, and ginger (the latter not in original recipe) add natural sweetness. Mostly for eye-appeal, I doubled the amount of raisins, which also increased the sweetness. 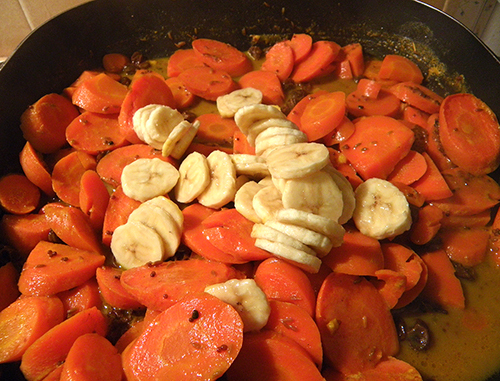 Using a large banana (or 2 small ones) make the curry desirably thicker. The original recipe calls for 1½ tsp. cornstarch if needed, but using more banana eliminates the need (and the fuss) of it. Originally, this recipe required 4 tablespoons of butter. Written in 1978, yes? I cut the quantity in half, and substituted walnut oil for half of that. You can choose all butter, all walnut oil, or experiment with another light (non-GMO/genetically engineered) oil, like sunflower or coconut. Feel free adjust the spicing as you like, finessing the quantities to your liking. 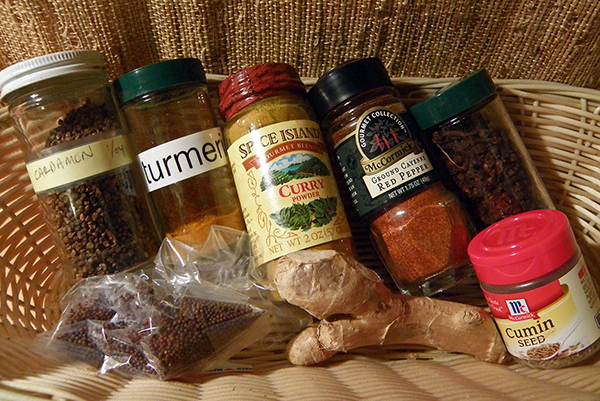 The amounts of cayenne and mustard seed make for a moderately “warm” curry, and are adjustable in either direction. 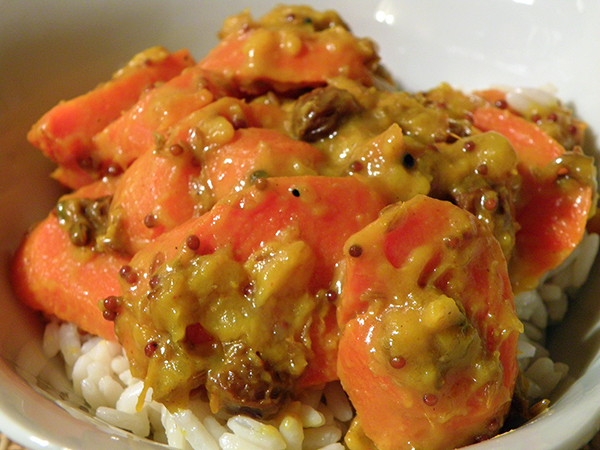 Enjoy this curry over rice, millet, quinoa, couscous, or other grain. Scrub and slice carrots diagonally about 3/8 inch thick. You will have 4 – 5 cups. Put carrots into medium saucepan and add orange juice and salt. Cover carrots with water, approximately 2 cups. Bring to boil, then reduce heat to medium and simmer about 5 minutes. Meanwhile, melt butter in medium-large skillet or electric frying pan. Add walnut oil immediately when butter melts. Add cumin, mustard, cardamom, curry powder, ginger, cayenne, and cloves, and stir until coated with oil. Simmer and stir frequently at over medium-low heat (275 – 300 degrees F.), cooking spices gently and evenly. 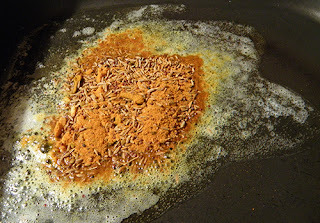 Add carrots with liquid to spice mixture in frying pan. Stir in raisins. Bring to boil, then simmer 10 minutes. Meanwhile, slice banana thinly. Add banana to carrots, stir, and continue simmering another 20 minutes, stirring every 5 minutes or so to distribute the spices and cook banana evenly. Serve over rice or other grain.